New York has became the latest state to pass legislation requiring that all smoke alarms sold have “long-life” batteries. 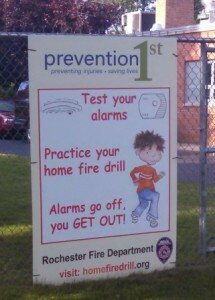 So why are Mikey and Prevention 1st still telling you to test your alarms when you change your clocks? Even for smoke alarms that have long-life batteries—or are hard-wired—it’s still important to make sure the alarm is working. Not every single long-life battery will work for 10 years, and even hard-wired alarms can fail. So yes, you should still test your smoke alarms at least twice a year — once a month is better, as recommended by the National Fire Protection Association. Mikey’s “Test Your Alarms” message includes your CO detector. The Consumer Product Safety Commission recommends pushing the test button on your CO detector (which tests whether the circuitry is operating correctly), to replace the detector at the age recommended by the manufacturer, and most importantly to go outside to fresh air immediately if it goes off. That goes for smoke alarms too. Mikey’s third message is simple: When the alarms go off, you get out. Searching for the source of the CO or the fire could be a fatal mistake. 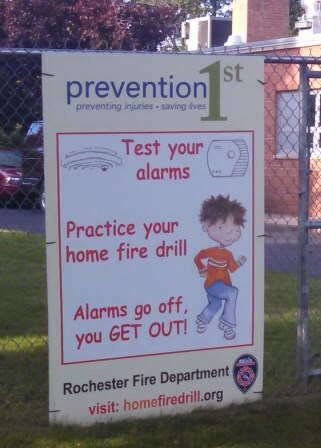 Why does Mikey want you to practice a home fire drill? Because even the best alarm can only protect your family if everyone knows what to do when it goes off. And if that happens at night when people are sleeping—the time when most fatal fires occur—it can be harder than you think to get up and out quickly. Make sure hallways are kept clear of clutter and that everyone knows at least two ways of getting out—one of them may be a window—especially from bedrooms. Make sure everyone understands how important it is to go to your outside meeting place, so if there is a fire you’ll know whether everyone is out. When the fire service arrives, tell them if everyone is at the meeting place and about any pets that may still be inside.